Russolo was born April 30th, 1883 into a musical family, but decided to become a painter upon moving to Milan at the age of sixteen. He first exhibited a group of etchings in 1909 at the Famiglia Artistica, where he met Boccioni and Carrà. Together they persuaded Marinetti of the potential for Futurist painting. 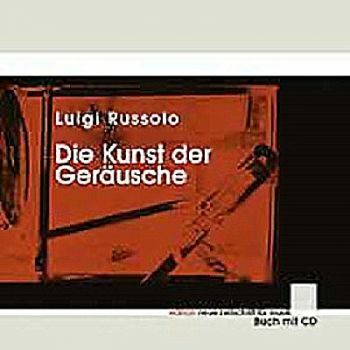 Despite this early involvement Russolo painted few works as a Futurist. His principal involvement was as a musician, calling for the integration of unconventional sounds into musical compositions. 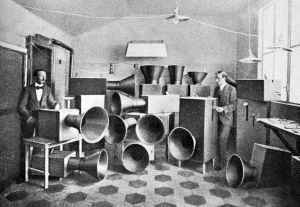 He developed new instruments called intonarumori (‘noise-intoners’) to replicate the booms, hissing and buzzing of the machine age. He brought his controversial performances to London in 1914 and these expanded to major concerts in the 1920s. Russolo spent an increasing amount of time in Paris during this decade, perfecting and inventing other instruments. These included the Russolofono, a keyboard capable of combining the sounds of individual intonarumori. Between 1931 and 1933 Russolo studied occult philosophy in Spain. He began to paint once more during the 1940s, holding one-man exhibitions in Como and Milan. He died in 1947. 01. Luigi Russolo – Risveglio di Una Citt?